Toscanini New Symphony Orchestra, Conducted by Giuliano Crisi, to Perform at Holy Rosary Church | Ciao Washington! 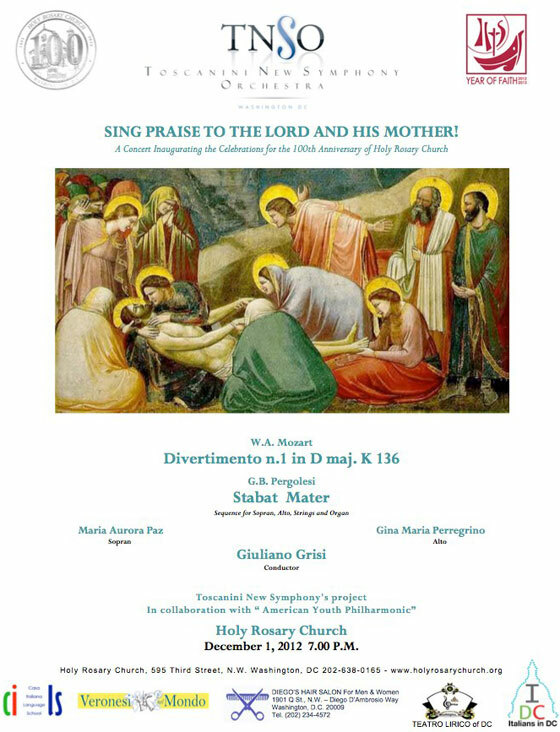 A concert by the Toscanini New Symphony Orchestra, inaugurating the celebrations for the 100th anniversary of the national Italian church, Holy Rosary Church, will be held at Holy Rosary Church on December 1, 2012 at 7:00 pm. Giuliano Grisi, possibly Italy’s youngest conductor will be leading Maria Aurora Paz, soprano, and Gina Maria Penegrino, alto, in performances of Mozart and Pergolesi. Great Performance! The students were brilliant so was Giuliano Grisi, the Conductor. Beautiful Voices of both the Soprano and Alto. Congratulations and always ad majora! « Where in the Nation’s Capital is the National Italian American Heritage Museum?